It’s not often that a book brings me to tears, but The Old Man and the Waste Land by Nick Cole did just that. Cole’s writing is so incredibly beautiful you cannot help but cry over the awe inducing descriptions of a sunset… only to realize that it’s a sunset in post apocalyptica. 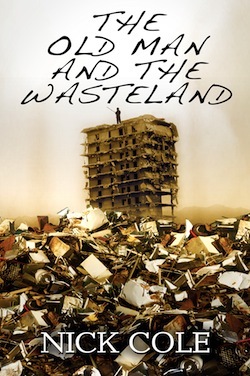 The Old Man and the Waste Land is the story of the destruction of civilization where man is reduced to salvaging the ruins of a post apocalyptic world. A survivor of the Nuclear Holocaust journeys into the unknown, with the words of Hemingway’s The Old Man and Sea echoing in his head, to prove to himself that he is still somehow useful. Even the way Cole describes the “Horde” that develops out of a now lawless society is full of awe and wonder. All of it is so exquisitely written that you cannot help but feel that you are there in that very situation experiencing it for yourself. Cole’s story is also one of survival and endurance. The Old Man must use his wits to survive the desert wilderness and lawless inhabitants of what is left of our world to discover the truth behind Hemingway’s classic tale of man versus nature. I cannot say enough about how beautiful Cole’s prose is! He tells a story in such a way that you become immediately emotionally connected to the main character. You find yourself holding your breath when things are not going well for The Old Man. You root and cheer for him in the hope that even though society as we know it has been destroyed, The Old Man and his village can be rebuilt and start anew. I urge you, no I demand that you go out and buy The Old Man and the Waste Land! You will not be disappointed!